» What Would It Take to Hit .400 in the 21st Century? Bert Be Home By Eleven? Not sure where to find the best online sportsbooks? Start your search with PlayersJet. Get deals at SportsMemorabilia.com on baseball apparel, including Phillies jerseys and more for adults and children. Shop the largest selection baseball equipment on sale at Sports Unlimited. Check out tons of baseball gloves, youth baseball gloves and catchers gear from Rawlings, Wilson, Nike & Under Armour. Today's regularly scheduled programming has been changed. It was my intention to rank the Top Ten Free Agent Pitchers. However, I couldn't resist discussing the free agent signing of Juan Pierre and what it might foretell for the future of the Los Angeles Dodgers. I'm quite certain that General Manager Ned Colletti believes he just found the perfect fit for his ball club. With Pierre now in the fold, the Dodgers don't have to worry about a center fielder or a lead-off hitter for five years. Yes, five years. Wait a minute. . .Come to think of it, this signing means the Dodgers do have to worry about center field and the man at the top of their lineup for five years. And that, my Dodgers friends, is the problem. As I see it, this acquisition says more about Colletti and his "old school" philosophy than any move he has made thus far. If he believes tying up $45 million over the next five years on a player such as Pierre is a good use of the organization's resources, well, what can I say that I haven't said already? Pierre has led the league in hits in two of the past three seasons, but he has also finished in the top two in outs in each of the last four campaigns. The hits are nice. The outs are painful. As a lead-off hitter who plays everyday and doesn't walk or strike out much, he gets plenty of both. The bottom line is that Pierre is one of the most overrated players in the game. He was first-team All-OOPs in 2006 and second-team All-OOPs in 2005. Pierre can still run and, in fact, has finished first or second in stolen bases in every full season of his career. He can chase down fly balls but his arm is well below average, making him nothing more than a passable center fielder. In order to be defamed as an All-OOPs honoree, a player, by definition, is a singles hitter who only walks on occasion and rarely slugs home runs. In other words, batting average makes up the lion's share of his value. I mean, I just don't get it. Here is what I wrote in the comments section attached to yesterday's article. Why the Dodgers would ink Pierre to a long-term deal is beyond me. Not only do they have Matt Kemp in waiting but re-signing Kenny Lofton for one year could give the team almost everything Pierre can (albeit in 25 or so fewer games) for a lot less money - and I'm not even a Lofton fan! In the grand opening of Weekend at Colletti's last year, the movie poster stated, "Ned Colletti would be the perfect General Manager except for one small thing. . .He's working for Frank and Jamie McCourt." Well, it's no longer on the McCourts. You see, the Pierre signing is on Colletti and nobody else. No blaming Frank and Jamie here. No blaming Paul DePodesta. Heck, you can't even blame Al Campanis for this one. As a public service for all Dodgers fans, I am hereby releasing the sequel to last year's blockbuster. The name of the movie? 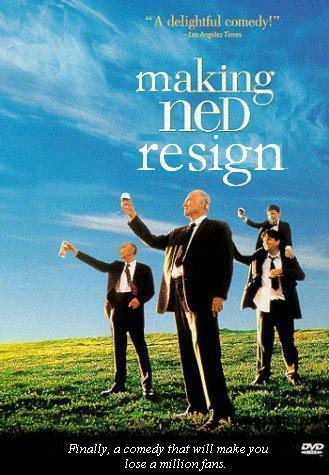 Making Ned Resign. Just in time for the Thanksgiving holiday. Who knows? Maybe it will be a (Logan) White Christmas after all. If not this year, then perhaps next. Is there some buddy movie that could be happening here with Ned Colletti and Jim Hendry? The Soriano contract is foolish, but the Pierre contract is even worse. It's total crap. We're talking about a guy who had a .680 OPS in 2005, and what was it this year? .714? His stolen base rate fluctuates from year to year, but it's never that hot - if he has a year with the bat like 2005 and a year on the basepaths like 2004, you've got a player who isn't even worth $1 million. Soriano, at his nadir, is probably going to be Jacque Jones. Juan Pierre, at his nadir, is going to be Willie Harris or Nook Logan. Pierre and his contract is Lofton squared times five. Worse, the stuff Pierre can't do - throw, hit a ball more than 250 feet in the air, look at ball four - is stuff lots of Dodgers can't do. Ned is a freaking Giant. A plant. A shill. A triple agent.... I'm baffled. Come on guys, you're being too hard on Juan. Let's not forget he hit 41 home runs and slugged .531. Plus, he is the best defensive centerfielder in the league. Oh, wait...did you say Juan Pierre? I thought you said Andruw Jones. It's not even this year that's the real problem. Juan may hit .305 with a .350 ob% and 50 steals - that would be acceptable. The problem is the tail end of this deal when he's hitting a very empty .260 and people are wondering what he's doing out in CF. It's the long-term effect of his presence blocking the emergence of some young player of quality that makes this deal foolish. Two years of Dave Roberts would have looked much smarter. Boom. Anything that .305/.350/50 did for you is demolished by those two numbers. And this isn't speculation, it is what Juan has done over and over again throughout his career. The signing is a joke. Ned is a joke. Compare our management to San Diego's. Now cry. And that's not even mentioning that Kemp could play CF and Delwyn Young could play RF and then sign Bobby Abreu in '07. Or Ethier could move to RF '07 and the Dodgers could get Adam Dunn. Also, Furcal is already the Dodgers leadoff hitter and I would think any number of guys in the order could bat second (Nomar, Ethier, Kemp, Betemit, Martin). I guess when you're not paying Darren Dreifort you got to do something with these wads of cash. As a Giants fan I would just like to thank Mr. Colletti. Keep up the good work, Ned! Many of my casual-Dodger fan friends are happy about this signing. So am I, because I am a Cub fan and despise the Dodgers. Thanks for taking Juan off our hands, Ned. I guess the rationale behind this deal is that there must always be one huge albatross of a contract hanging over their heads: Dreifort (5 yrs, 11M per), followed by J.D. Drew (another $55M deal) and now this debacle. However, I guess I can understand Ned's thinking: when you have a minor league system almost completely bereft of talent, play in a run-down old stadium in a minor media market, and have attendance to rival a WNBA game, you have no ability to make trades or sign quality free agents, so you take what you can get. Unfortunately, somebody needs to remind Ned that he's the GM of the LA Dodgers, not the Kansas City Royals. This almost enough to make me wish that I was a Giants fan, because the schadenfreude must be awesome on this one. Wow. This makes me want the Dodgers to quickly trade my favorite player Hong Chi Kuo to any other team for nothing. seriously, if they really do pull this bullshite, then the Dodgers better hope Kuo and Billingsly are dominating aces in the next 5 years, cause that's what it will take to give them even a remote shot at the playoffs. This is a bad contract and for to many years. Lofton for one year is ok. Hell even trading Bills for Wells might be ok. But this contract is just wrong. The only way this contract could work out is if the inflation of contract continues at a very fast rate to make 9M seems liek 5M 3+ years from now.